Gingerbread Cookies are wonderfully fragrant with the flavors of molasses, ground ginger, cinnamon, nutmeg and cloves. They make perfect cut-out cookies as they keep their shape when baked. 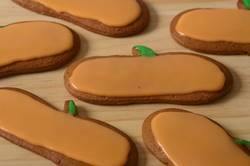 For Fall, I like to make pumpkin shaped cookies and frost them with an orange glaze. If you like your Gingerbread Cookies on the soft side bake them a little less than the recipe states. The longer they bake the cookies, the harder they will become. In England and North America, we usually make our gingerbread with treacle or molasses. Ground ginger and cinnamon are almost always present, with sometimes ground cloves and nutmeg. There are two types of molasses generally used in making gingerbread: light and dark. Light unsulfured molasses, used in this recipe, comes from the first boiling of the sugar syrup and is lighter in flavor and color than the dark molasses. Dark molasses comes from the second boiling and is darker in color with a more robust flavor. Molasses is usually labeled as "sulphured" or "unsulphured" depending on whether sulphur was used in the processing. The unsulphured molasses is lighter in color and I think it has a nicer flavor. Molasses is used in baked goods to add color, moistness, and flavor. Now, you don't have to frost these cookies as they are excellent on their own. But they do look and taste great when covered in either a glaze (used here) or royal icing. I really like using this glaze as it's easy to make, easy to use, tastes good, and dries to a hard finish. Gingerbread Cookies: In a large bowl, sift or whisk together the flour, salt, baking soda, and spices. In the bowl of your electric stand mixer, fitted with the paddle attachment, (or with a hand mixer), beat the butter and sugar until light and fluffy. Add the egg and molasses and beat until well combined. Scrape down the sides and bottom of your bowl as needed. Gradually add the flour mixture beating until incorporated. Divide the dough in half and then roll each half between two sheets of lightly floured parchment or wax paper until it is about 1/4 inch (.5 cm) thick. As you roll, periodically check the top and bottom sheets of parchment and smooth out any wrinkles. Place dough on a baking sheet (along with the parchment paper) and place in the refrigerator until firm (this will take at least two hours or overnight). Once chilled, remove from refrigerator and peel off the top piece of parchment paper. Use a floured cookie cutter to cut out the cookies. With an offset spatula lift the cut out cookies onto a parchment lined baking sheet, spacing the cookies about 1 inch (2.5 cm) apart. Place the baking sheet with the unbaked cookies in the refrigerator to chill while you preheat your oven to 350 degrees F (180 degrees C). Bake the cookies for about 10 - 14 minutes depending on the size of the cookies. Small ones will take about 8 - 10 minutes, larger cookies will take about 12 - 14 minutes. They are done when they are firm to the touch and the edges are just beginning to brown. Remove from the oven and place your baking sheet on a wire rack. Let the cookies cool for a couple of minutes in the pan before transferring to a wire rack to cool completely. Glaze: Place the sifted confectioners sugar in a bowl. Stir in the corn syrup and about 3 tablespoons of the water. Check the consistency and add more water if needed to have the glaze at a spreading consistency. Stir in food coloring if using. Using an offset spatula or the back of a spoon, spread the glaze onto the cookies. Place on a wire rack and let the glaze dry. This may take several hours. Once the glaze has completely dried, the cookies can be stored in an airtight container at room temperature. Makes about 20 - 5 inch Cookies.